Der Sieger ist Tam�s Nagy. Herzlichen Gl�ckwunsch! An beiden Tagen wird die Text-Coverage von einer Live-Video-Coverage via Twitch begleitet. Die Kommentatoren sind Matej Zatlkaj, Frank Karsten, Simon G�rtzen, Rich Hagon & Steven Leeming. Der Sieger ist Ryan Scullin mit Mardu Midrange. Herzlichen Gl�ckwunsch! An beiden Tagen wird die Text-Coverage von einer Live-Video-Coverage via Twitch begleitet. Die Kommentatoren sind noch nicht bekannt. Der Sieger ist John Farrow mit Sultai Reanimator. Herzlichen Gl�ckwunsch! Der Sieger ist Will Fleischman mit U/R Delver. Herzlichen Gl�ckwunsch! Der Sieger ist Logan Mize mit U/R Delver. Herzlichen Gl�ckwunsch! An beiden Tagen wird die Coverage von einer Live-Video-Coverage mit Patrick Sullivan & Cedric Phillips begleitet. 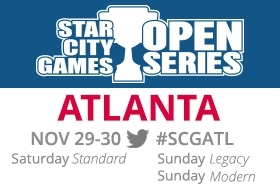 F�r weitere Infos siehe das SCG OS Atlanta 2014 Fact Sheet. Dieses Siegerbild d�rfte eines der Besten sein, das ich bisher je gesehen habe. Meiner Meinung nach ist es eine gelungene Darstellung des Ausdrucks "Last Man Standing"! F�r weitere Infos siehe das PTQ Fate Reforged Fact Sheet. Der Sieger ist Seth Manfield. Herzlichen Gl�ckwunsch! An beiden Tagen wird die Text-Coverage von einer Live-Video-Coverage via Twitch begleitet. Die Kommentatoren sind Marshall Sutcliffe, Ben Stark, Brian David-Marshall, Rashad Miller & Rusty Kubis. Der Sieger ist Harlan Firer mit Jeskai Combo. Herzlichen Gl�ckwunsch! Der Sieger ist Marc Konig mit Death And Taxes. Herzlichen Gl�ckwunsch! Der Sieger ist Niklas Kronberger mit Scapeshift. Herzlichen Gl�ckwunsch! An beiden Tagen wird die Coverage von einer Live-Video-Coverage mit Matthias Hunt & Cedric Phillips begleitet. 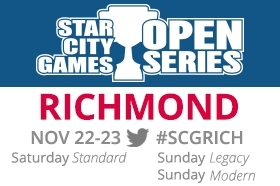 F�r weitere Infos siehe das SCG OS Richmond 2014 Fact Sheet. If I teach a dog to play Magic, can he use his age in Dog Years for Granny's Payback? Would it be possible in the current color pie for Green to use it's creatures to tap the opponent's creatures? [+]No, tapping creatures is white and blue. Green can untap creatures though. So Planar Chaos was considered a mistake because it was too weird for newer players. Would a Planar Chaos-esque summer set ever work? [+]The problem with a ?what if? set is that it confuses the baseline for what the game (and the color pie) is. How bad a color pie violation do you consider Guttural Response? [+]Pretty bad. Neither red nor green is supposed to be able to counter spells. What are the "kick" and "punch" mechanics from Kamigawa? They sound cool! [+]Brian Tinsman, the lead designer of the Champions of Kamigawa, played around with a mechanic where the planeswalkers were having a martial artist fight. It never worked well and got cut in design. Re: Dragon's Maze split cards, the color combos were set up so that each split card had one guild from RTR and the other from Gatecrash. [+]That is correct. I forgot about that. How many sets have you been a developer on? [+]Twenty or thirty. I?ve been on more development teams than all the current developers save Erik Lauer. I feel like with my experience with people, the hexproof/shroud divide gets more apparent when they coexist. Has any market research been done about this? [+]We have a limited amount of evergreen keywords we?re willing to support. We don?t want to spend two vocabulary words on mechanics so similar. Any tips on overcoming mental or creative blocks? [+]Do something to approach your problems from a different vantage point. Try to think about it in a way you haven?t thought about it before. How are you as a developer when it comes to Un-cards? [+]Overall I?m not a bad developer. I?m just not good at power-setting. [+]Tournament Magic is but one way to play Magic. And plenty of people do innovate in tournament Magic. Is there a reason why the Dragon's Maze gold split cards are a mix of shard and wedge colors instead of being all shards or all wedges? [+]I think we were matching good names. So there wont be any wedges present in Dragons of Tarkir? Can I tap three islands for blue mana, play Cheatyface, and then use the three blue mana which I did not use on Cheatyface on something else, revealing only then that I did not pay for my Cheatyface? [+]If your opponent sees you play it, then you didn?t sneak it into play and thus you have to pay the mana cost. Is there any design space for a double-faced land? Can I get a patented "There's always a chance" answer on if we'll see a Jund colored Ooze sometime? Could clones (or some variant) theoretically be in green? Mimicry is fairly common in nature and green is all about creatures. [+]Populate was in green and that was clone-like. I?m not sure they?d be flavored as clones but green is number two (although a distant one) in duplicating creatures. [+] icecreamsocialism: "i?m 8.5 inches"
Could "cast a spell" be a cost for an ability? [+]Doesn?t seem likely. What does that even mean? Is there any reason -other than flavor- to not just replace Regeneration with Indestructible or "[Cost]: [Card name] gains indestructible until end of turn"? [+]It?s a different power level and affects the designs of other cards. And the flavor miss can be considerable. What about a new keyword that is basically a cleaner version of regenerate? [+]I can?t accept unsolicited design ideas. Sorry. [+]I would debate that last sentence but no, I haven?t considered doing anything with banding other than continuing to ignore it. How long does it usually take to get a rules changed approved? Does it have to be accepted by all the departments? [+]It depends on how big the change is. Some things I just do by myself and maybe let development know. Other things get input from some of R&D. Big things get input from of all of R&D and perhaps folks outside of R&D. Last night, while playing with a friend, I got mana-screwed and deliberately disobeyed the maximum hand size rule. It had no effect on the game other than being more fun for me and taking less time. [+]Single point of data noted. Watch Standard Grand Prix San Antonio Live! Frage (16669): Kann ich beide Teile von Feuer / Eis (Fire / Ice) wirken, wenn ich vier Mana bezahle? Frage (16668): Kann ich mit dem Elfenpionier (Elvish Pioneer) die Ein-Land-pro-Zug-Beschr�nkung umgehen? Frage (16667): Ich spiele einen Erntewurm (Harvest Wurm). Muss ich ihn opfern, wenn ich kein Standardland im Friedhof habe? Frage (16666): Erh�lt der Dschungelwurm (Jungle Wurm) -2/-2, wenn er von drei Kreaturen geblockt wird? [+] Magic: the Gathering - Game Store Mural Here?s Eric Lopez (@lacunagizm0) finishing off an impressive wall painting at Sun Blast Comics, Weslaco, Texas.� Great work�! [+] Magic: the Gathering - Garruk-ing Some very impressive work on this Garruk illustration by the very talented Niina Ohvanainen, 'cartilaj' on deviantart. [+]ascendedminionproject: Mail from Steve! It was a long wait, but well worth it! This is the back of an Arbiter proof!! - Minion 307 Now this is very nice!� Is it pencil? - Justin It?s pencil, graphite powder and white charcoal. �Gettin? fancy with my sketches. [+]This is a StarCityGames.com Premium Article. Click here to sign up.Khans of Tarkir has made a big splash in every Constructed format, and Modern is no exception! Brad and Todd test out some tweaked Modern lists for the $5,000 Premier IQ at #SCGATL! [+]This is a StarCityGames.com Premium Article. 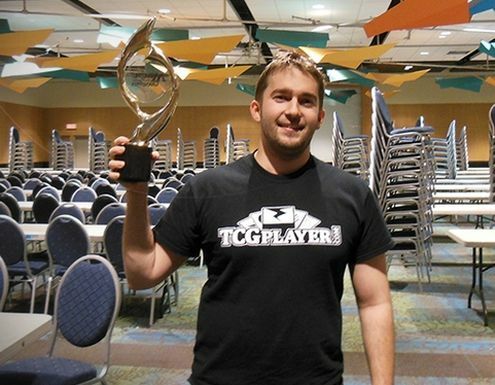 Click here to sign up.Brad's latest success story is all yours for #SCGATL! Being that the main man is already ready for his next big production, he's ready to bestow upon you the ins and outs of piloting his latest Standard wild card. [+]Ever the expert on precedent, Carsten Kotter sees a lot of an old powerhouse in current Legacy top tier strategies. Is there an unbeatable deck out there waiting to be found for #SCGATL? [+]This is a StarCityGames.com Premium Article. Click here to sign up.BBD returns to chronicle the differences he made in his life that led to an impossibly prestigious win at Grand Prix New Jersey! See what BBD knows that you don't before #SCGATL tomorrow! [+]This is a StarCityGames.com Premium Article. Click here to sign up.To the surprise of no one, Brian Kibler is reveling in a Standard format without Lifebane Zombies. See what Brian thinks of the latest new brews before they're put to the test at #SCGATL! [+]Adrian Sullivan is a Magic veteran, and he didn't become one by tilting and being self-deluded. Read about some of the mistakes he's made along the way and try to be as perfect as you can for #SCGATL! [+] suppermariobroth: Evolution of Mario?s model complexity. Top: Super Mario 64, middle: Super Mario Sunshine, bottom: Super Mario Galaxy. Squire Cast Episode 05: Removal? No, remove THAT one! [+]If Magic were just Magic Online and there were no logistics issues, I?d do double-faced cards every set. [+] fattyblackmoth: spitzem: Ness left after I did this. I suddenly feel like someone out there wants me dead You stole their thunder.